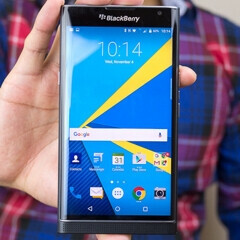 Planning to buy a BlackBerry Priv, or a BlackBerry Passport off contract? You may want to do it this month, as both smartphones are part of a Valentine's Day deal that sees their prices cut (not by too much, though). Starting today, and until February 24, an unlocked BlackBerry Priv costs $649.99 (down from $699.99), while an unlocked BlackBerry Passport - in either black, or white - can be yours for $399.99 (down from $499.99). Both new prices seem to available only if you're purchasing the handsets from BlackBerry's official online shop - check out the source link at the end of this article. The new Priv price includes BlackBerry's previous offer, thus you can actually get not just the Priv, but also a leather Smart Flip Case, and a Sync Pod (for transferring data between the smartphone and your computer) for $649.99. The BlackBerry Priv and BlackBerry Passport are two very different smartphones, not just when it comes to design (the Priv is a slider, while the Passport is an unusually wide slate), but also when it comes to OSes: the Passport runs BlackBerry OS 10, while the Priv runs Android Lollipop (upgradeable to Android 6.0 Marshmallow). To find out more about the two handsets, check out our BlackBerry Priv review, and our BlackBerry Passport review. I disagree. The Priv looks good, but the Passport still looks clunky. When you pick up a Passport, it exudes quality. The number of phones I have picked up out of my 200+ smartphones that felt that good in the hand is under 5, but the Passport is one of them. I would still have my Silver, but I'm just not a pkb guy, so that was lost on me. Agreed. Both devices are indeed gorgeous. I especially like the design of the Passport. It has a refreshing look when compared to all of the "me too, tastes like chicken" slabs that are out here today. I would say that the Priv discount by itself isn't too great, but considering that you also get the leather Smart Flip case and the Sync Pod for free, a $99 value, I'd say it's a great deal. The discount on the Passport is sweet, and the case and Pod with it for free make it an awesome deal. Both handsets are extremely capable, and worthy additions for anyone to have. I'm extremely satisfied with using them both as my daily drivers. Still expensive. Priv price must now be $499. The S7 and G5 are coming, and the Priv wouldn't have a good chance to compete here. Nexus 6P, iPhone 6, Galaxy S6, Note 5, and LG G4 already got a very big discount. BlackBerry must do the same to stay relevant and sell well. Still overpriced I agree. There are far too many smartphones out there that offer more value for the buck. Nexus 6P and Moto X Pure Editions are universally unlocked so you can use them on any carrier, they are stock Android, and they have cutting edge specs. I don't understand why Blackberry thinks they can still charge a premium for a device that is getting outclassed at the moment. Blackberry fans will eat it up of course but for everyone else, it's just another Android phone. They should port android to the passport. Just saying. Or is it android already just like the priv? Priv cost too much for sd 808.